Is it beer? Is it wine? Yes! I have long been both a beer and wine aficionado. So, a few years ago, when I noticed a new style of beverage combining elements of my two favorite drinks, I was gung-ho to taste them. And I wasn’t disappointed! A growing number of craft breweries are releasing Beer-Wine Hybrids – beers that have wine as a portion of their ingredients, and some of these are nothing short of amazing! My first experience with a beer-wine hybrid was in Brussels in the late eighties. 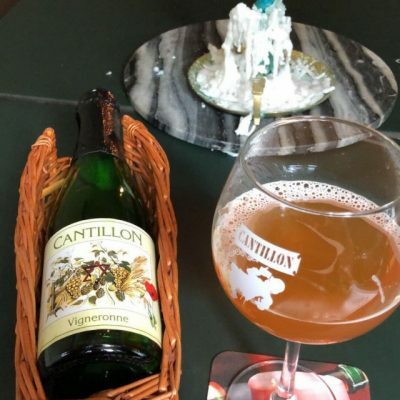 I had visited the Cantillon brewery – the Holy Grail of Lambic breweries – and had picked up a bottle of Vigneronne, which is Lambic beer fermented in casks with Italian Muscat grapes. Wow! I had never tasted anything like it – it was fantastic! Cantillon also adds tart cherries, raspberries, and other fruits to their beers, but the Muscat grapes were something else. Years later, I tasted hybrids from Dogfish Head and wine barrel beers from Russian River. These breweries were on the leading edge of the beer-wine hybrid movement. When we talk about beer-wine hybrids, what exactly are we talking about? Well, for starters they are basically beers. In some cases, the beers are aged in used wine barrels – imparting wine flavors and aromas. In some cases, beers are fermented with wine yeasts, resulting in new and different flavor profiles. And in other cases, wine grapes, grape juice, or grape must (freshly pressed grapes with skins, stems and juice) are blended with the beer – during or following fermentation. And often, the beer-wine hybrid utilizes all three of these techniques. While a lot of beer is aged in spirits barrels, beer-wine hybrids typically use white or red wine barrels. Freshly emptied barrels are best – providing maximum flavor and aroma. The style of the beer should be matched to a complimentary wine barrel. In addition to wines like Cabernet Sauvignon, Pinot Noir, Syrah, and Chardonnay, brewers can obtain Port, Sherry, Madeira, Sauternes and other wine varieties with the help of a barrel broker. The oak and wine notes from the barrel add whole new dimensions of flavor to a beer, and craft brewers are making good use of wine barrels in many ways. Wine yeasts work and taste quite different than beer yeasts. Ale and lager yeasts easily ferment both complex and simple sugars. Wine yeasts prefer simple sugars and can take forever to ferment out a batch of beer. But, the aromas and flavors produced by wine yeasts can be truly amazing. Wine yeasts can also kill beer yeasts, so mixing the two takes some finesse to work well. In particular, Champagne yeast is often used to put a dry finish on a beer or for bottle conditioning (when additional sugar and yeast is added at bottling to naturally carbonate the beer in the bottle). Of course, the ultimate beer-wine hybrid has to contain wine grapes in some form. 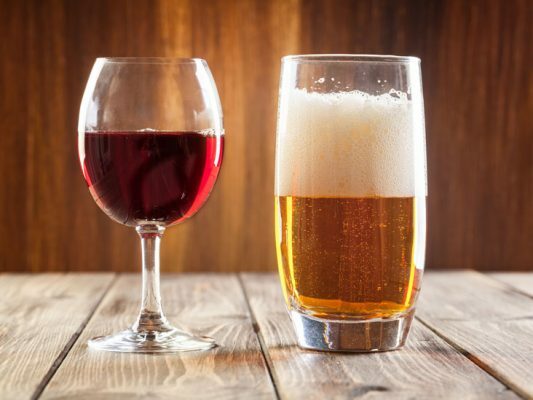 Dried grapes (raisins), wine must, grape juice or even whole grapes are added to the beer in quantities of 20–49 percent. When grapes and beer ferment together, their flavors bond in very interesting ways. A highly complex and pleasantly different taste profile is created. And when you combine all three beer-wine techniques – wine barrel aging, wine yeast, and the addition of grapes – the brewer can create magic! While a lot of breweries are now joining the hybrid movement, there are a number of them that pioneered the processes and techniques we see today. These breweries continue to make some amazing blends of beer and wine. Russian River’s founder, Vinnie Cilurzo, grew up in a wine-making family and was a pioneer in wine barrel aging going back to the 1990s. Founder Sam Calagione was one of the first large breweries to experiment with putting wine grape juice into beer to achieve levels of complexity and flavor. Bruz is my brewery. Having tasted a new style of Belgian beer – Deus Champagne Beer, made by Bosteels – I was inspired to brew one here in Colorado. The style is known as Biere Brut de Flandres and ours is called Brut La Grande. There are only a few breweries in the United States making this style of beer. Brut La Grande is a pale, lightly hopped beer that goes through a three-yeast fermentation process utilizing Belgian ale yeast, Champagne yeast and spirits yeast with additional sugar added with each new yeasting. It is bright, complex and drinkable with well-hidden alcohol (14.8%). Brut La Grande is released once a year just before the holidays. Based on the success of Brut La Grande, we are in the process of utilizing wine barrels, wine yeasts and grape juice in other hybrid beers. Other hybrid breweries include Crooked Stave in Denver, Avery in Boulder, New Belgium in Fort Collins, Block 15 in Corvallis, Oregon, The Bruery in Placentia, California, Cascade Barrel House in Portland, Oregon, Stone Brewing in Escondido, California, Firestone Walker in Paso Robles, California, The Commons Brewery in Portland, Oregon and Brewery Ommegang in Cooperstown, New York. Many more breweries are entering the wine-beer hybrid ranks every day, which means we all have some interesting tastings waiting for us. So is it a wine or is it a beer? The answer is yes!